Mention time trials and training session numbers often drop dramatically, don’t mention time trials and athletes complain that they couldn’t prepare properly… A pattern that is no doubt echoed through all sports, and at all levels. So, if it has such a detrimental short term effect on training, why do coaches persist with it? Long term athlete development is our main purpose; educate and develop athletes to perform at a higher level. Perhaps understanding more about what can be gained from testing will help get rid of those jitters, and encourage a few more to test their capabilities. Each type of test comes with its own set of pros and cons, eg a straight out time trial such as a 750 meter swim will give you as close a feeling as possible to the start of a sprint triathlon, but what about pace drop off, is this factored in? A lab test will give you very accurate numbers in conditions that can be replicated comparatively accurately, but performing in a laboratory is not the same as performing in a sport that is predominantly outdoor. To get the most out of the test and to understand what type of test is needed, firstly you have to look at the reason for testing. 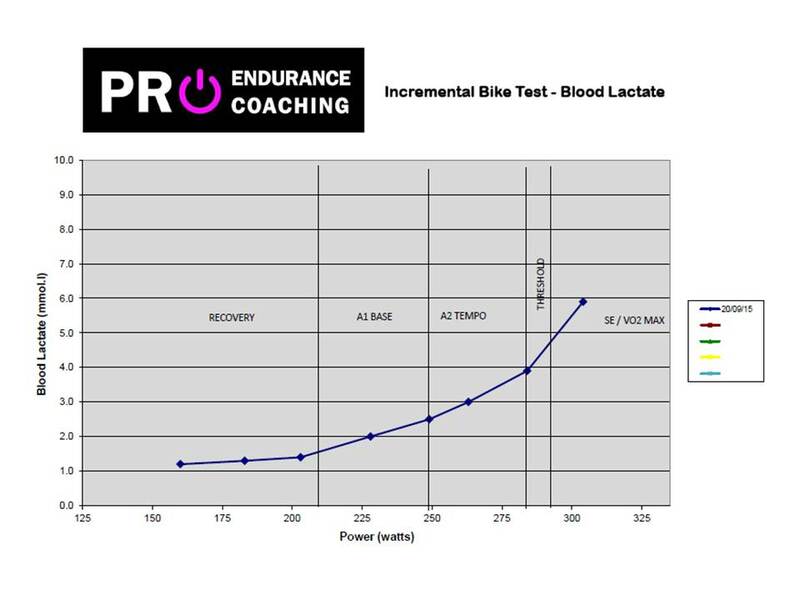 If you are looking to understand more about your training zones then a blood lactate test in the lab might be the best at that time. Whereas if you are testing to see how accurately you can maintain a pace, a test set such as 10x100m swim on a fixed cycle might the best at that time. Far too often athletes start too hard, get to the start line of your key race of the season and nerves are taught, adrenaline flowing through your body and butterflies that won’t go away- usually this leads to smashing the first 100m! This leads to a swamping of lactate and muscular fatigue, pace drops throughout and the resulting time is slower than expected. Knowing your threshold pace, and being aware of what the pace feels like might just save you from haemorrhaging time in the first part of the race! Training consistently can seem monotonous, what are the goals? If it is to get faster you need to test to see if it’s working; wait 8 months after a late August race and underperform in your first race in May and you might have just wasted your time training at the wrong intensity! Test and retest to make sure what you are doing is working, if it‘s not… CHANGE IT! Some people are born racers, there is no doubt, some can hit a start line and get the most out of themselves time and time again, it’s a rare and special quality!! For the rest of us we need to teach ourselves how to do this, we need to learn to ‘hurt’, learn to get the most out of ourselves when it really matters! You can train your body to be stronger, you can train yourself to hold better technique when fatigued, you can train your body to deliver more blood to your muscles, and you can also train your mental state to get more out of your body. Be positive, don’t limit yourself, control your emotion, be ready to push through the pain barrier… Its all easy to say, practicing it is much harder but absolutely essential. Training within a specific zone can target the correct physiological adaptations, whether you are a razor sharp anaerobic athlete, or a slow burning diesel aerobic beast you need to know how to work on your strengths and weaknesses. Ride 5 hours below your aerobic threshold and, apart from developing your metabolism, and perhaps gaining some strength development, you have not achieved much improvement in your aerobic efficiency. Tests interpreted properly can identify strengths and weaknesses, knowing your training zones can make your training far more efficient. When to do your tests, making sure you have enough time between tests to recover and adapt, and knowing your target goals and outcomes of tests are all essential in making testing worthwhile. If it’s to measure a specific improvement in a sport you might want to retest under similar circumstances. The targets from a test are individual and can change from test to test, make sure you know what you want from it. Once you have completed your testing you want to reflect on the results, don’t dwell on them too long, but use them to help improve as an athlete. Goal and target achievement is important, but sometimes the test might have achieved something besides the physical goal. Keep positive and be proud of your own journey as you aim for improvement, and finally be honest with yourself. If you missed your goal was it because you didn’t perform well, or was it simply because you didn’t train well enough to achieve your goal. PS Maybe the next blog will focus on Expectation vs Reality!